CC-1000 Indutherm Casting Machine Common Process for Melting The Continuous Casting Machines from now on with vacuum or quattro drive More flexibility, lower costs Indutherm continuous casting machines help you to save production costs. With only one machine,you can produce your own alloys or semi-finished products in different shapes and sizes in the shortest time. For example: Wires or bars in every diameter you need, up to Ø40mm (CC 3000)Sheets and strips, e.g. ring production, for stamping and pressing Tubes, perfect as basic material for cutting in sections for wedding ring productiongranulates The Main Advantages of Indutherm CC Machines: Short change-over times for various casting sizes A lot of additional equipment availableDiffusion bonding set (“sintering”) and granulation tank Induction generators with a low frequency tuning for a thorough mixing of the metal Automated inert gas High metal quality, free of porosity All continuous casting machines also available as VCC-versions with vacuum function (patent pending). With the VCC-versions, melting can take place under vacuum or inert gas. This is ideal for alloys containingcopper such as red gold, or for silver, as these materials tend to oxidize easily. Degasification under vacuum results in the substantially improved absence of oxidation in the melting chamber. On Request: With Quattro Drive The CC versions 1000 and 3000 are optionally available with “QUATTRO DRIVE”. That’s the name of the new drawing unit with four instead of only two motor driven feed rolls, which transport the material such as wire, sheet or tube down from the melting chamber. Thanks to the smooth transport with reduced pressure, the sheeting and tubes produced by this way show nearly none of the otherwise unavoidable marks of transportation. The need of intense post-processing such as polishing is clearly reduced. 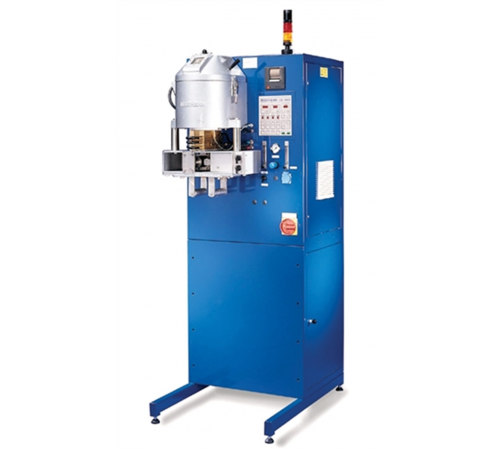 Performance CC-1000 Power Max Electrical Connection 25kW 3 x 400v Temperature Max 1500 °C Crucible Volume ● 1500ccm = 22kg Au 18kt* Wire Production up to ● Ø30mm Tube Production up to ● Ø40mm Sheet Production ● 100 x 10mm 16 Programs for Melting and Die Temp, Drawing Lengths, Stoptime, Reverse Draw ● Inert Gas Overpressure CC-1000 Vacuum (Optional) VCC-1000 Natural Inert Gas Atmosphere ● RS 232, Diagnostic System, Remote Service ● Data Printer ● Quattro-Drawing Unit ○ Sintering Kit – Granulating Tank ○ Bending Unit ○ Simultaneous Casting of Several Wires ○ 3 wires** Coiling Equipment ○ ..
you can produce your own alloys or semi-finished products in different shapes and sizes in the shortest time. in the substantially improved absence of oxidation in the melting chamber. as polishing is clearly reduced.